making them more appealing to American collectors. 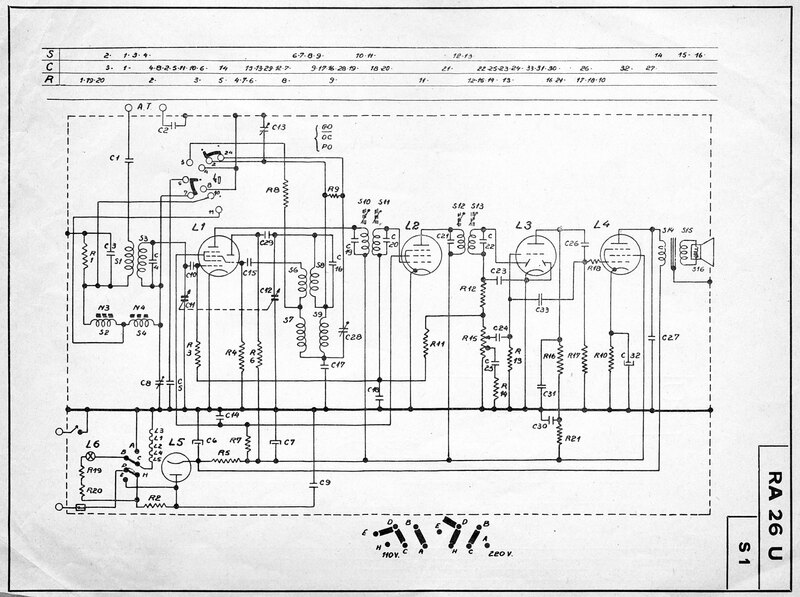 Click on the radio for a LARGER image. Laptop and Desktop users, Click on the " " to see a Flash interactive view of the radio. 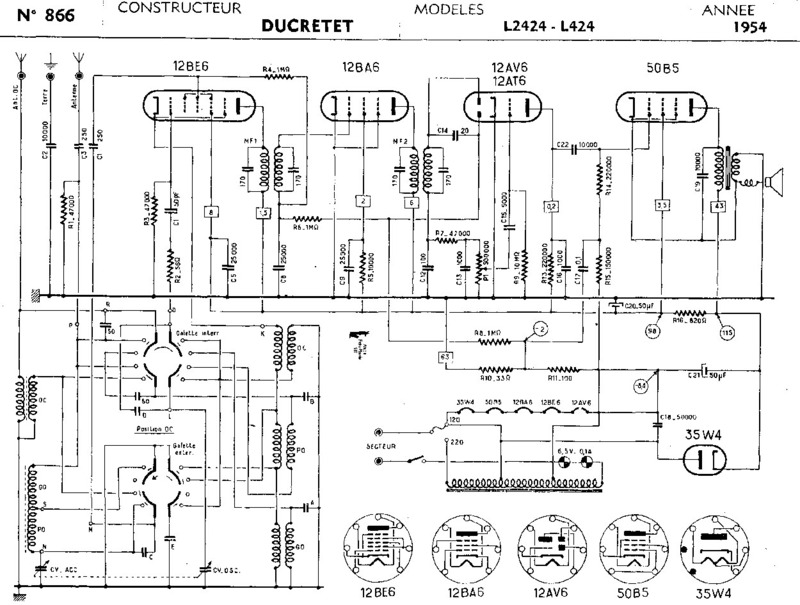 Ducretet model L2323 from 1953.
with only a few known to exist in this turquoise color. A damaged red one recently surfaced. 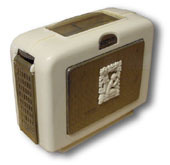 This is the model L424 radio with a white plaskon cabinet and reverse-painted glass dial. Grandin "Labrador", Very unusual asymetric design plaskon midget, with pushbuttons, 1958. Dramatically marbled brown bakelite model 44 made by Jicky. 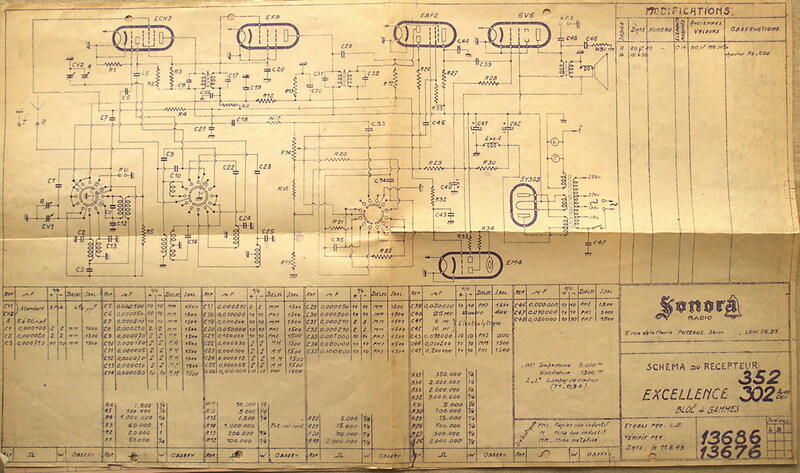 I'm still looking for a schematic, please let me know if you have one. 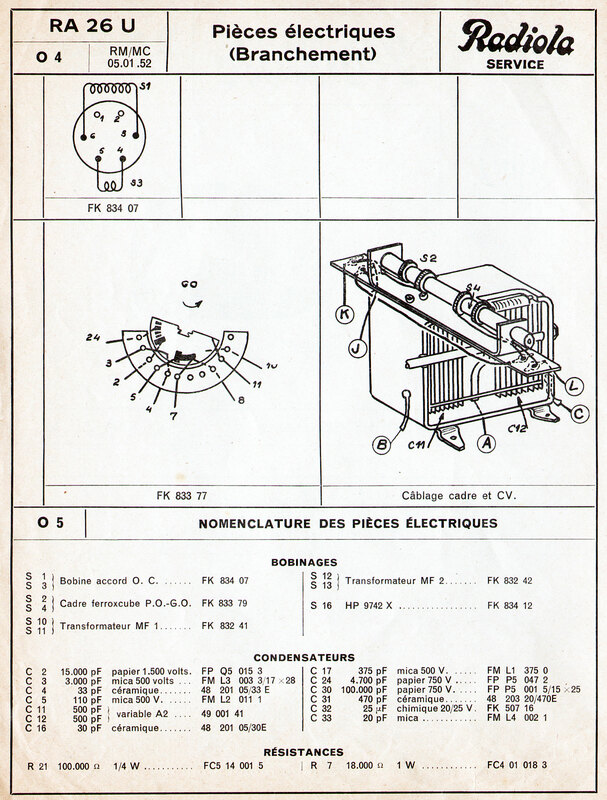 The 1953 Marconi "Baby" 41 is equivalent to the Pathe "Lutin" ("Goblin" or "Leprechaun") 451. 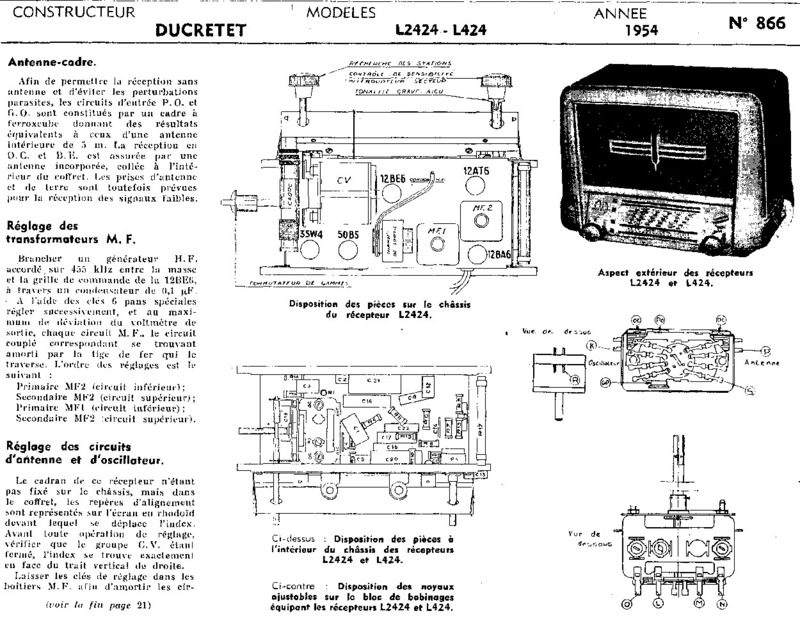 It is a 4-tube midget radio with a top slide-rule dial and recessed side thumbwheel knobs. Adorned with Pan playing a flute. the front and back halves, and the base. 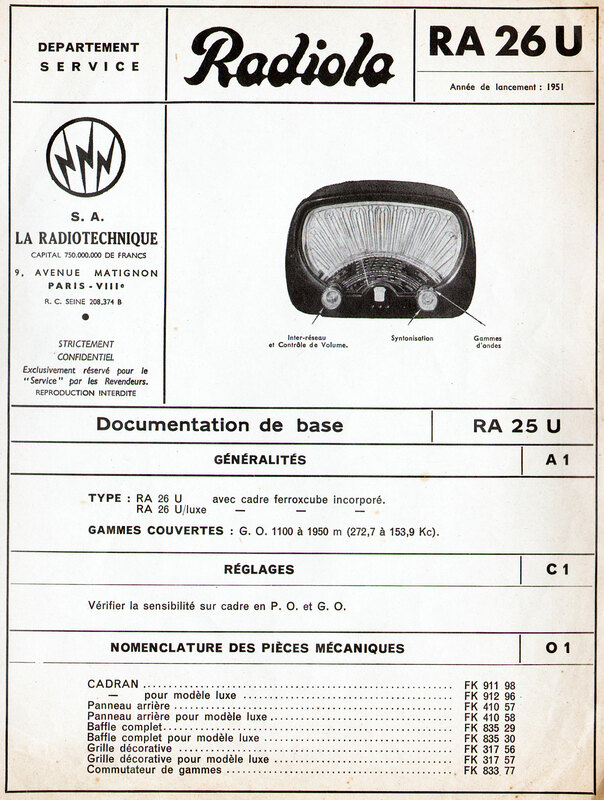 The bottom label shows the radio's specifications. with a glass reverse-painted dial. 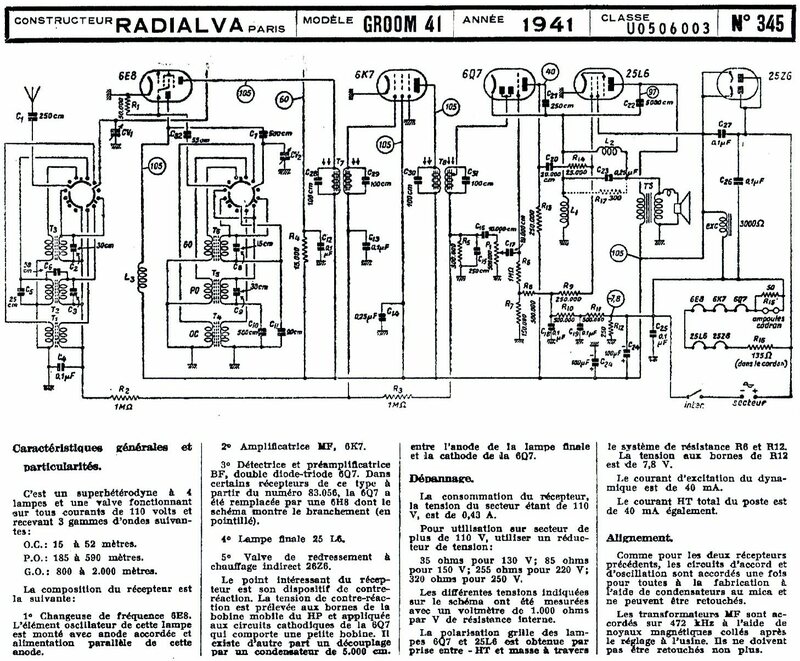 Three radios of identical size made in France in the early '50s by Radiola and Philips. Clear lucite grills of incredible design! The RA15U has the dial scale printed onto the grillcloth. 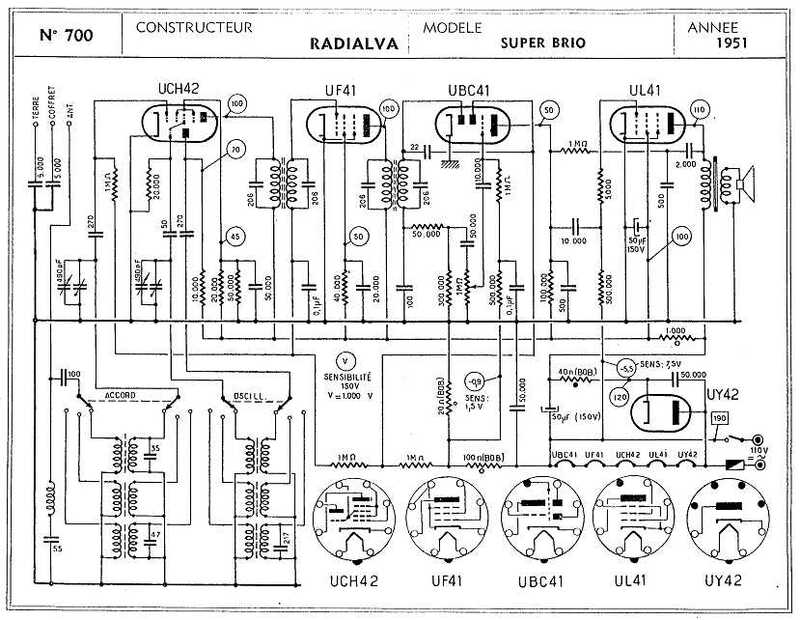 The BF101 and RA11U have identical circuits. or brown bakelite with a clear grille. 5 tubes; UCH42, UF41, UBC41, UL41, UY41. Turned on, the dial and Radiola logo have a beautiful mesmerizing glow. 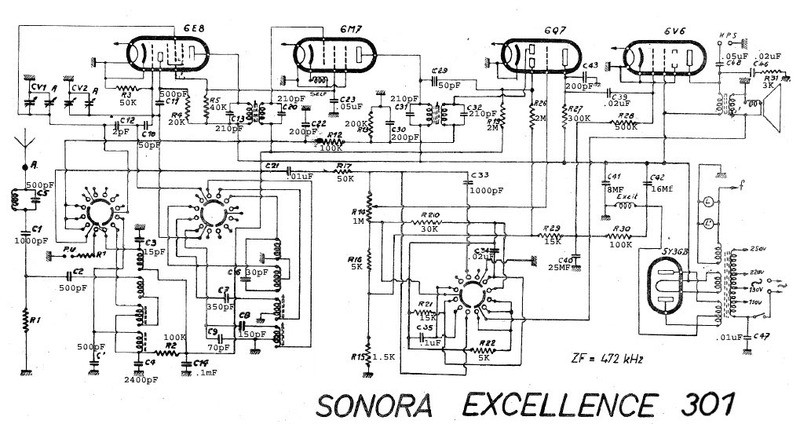 One of my all-time favorite radio designs. A beautifully marbled, 3-band, TV-dial "Super Groom" made in 1941. Sometimes found with various pin-stripe colors and knobs, or in solid brown bakelite. This radio is identical to the German Braun F56GW, other than the dial glass markings. 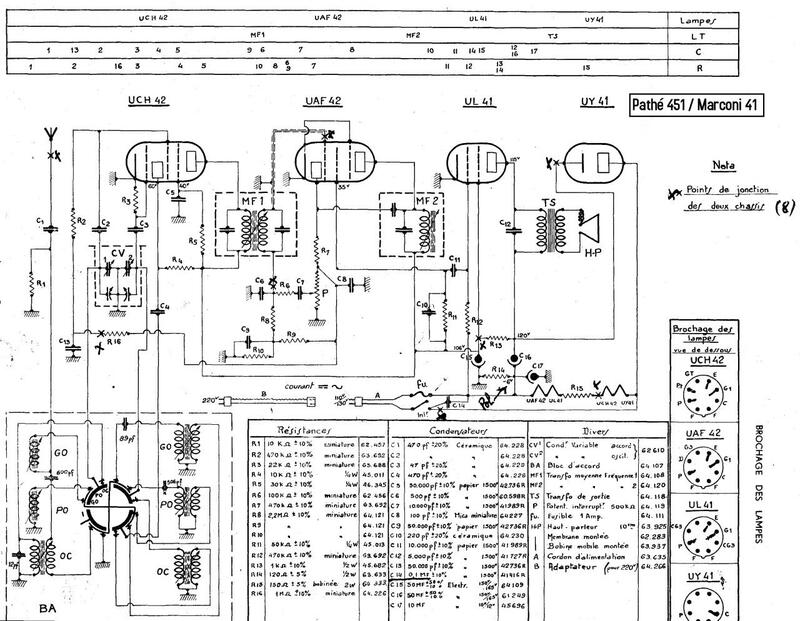 It used 5 tubes; 6E8G, 6K7, 6Q7, 25L6 and 25Z6. 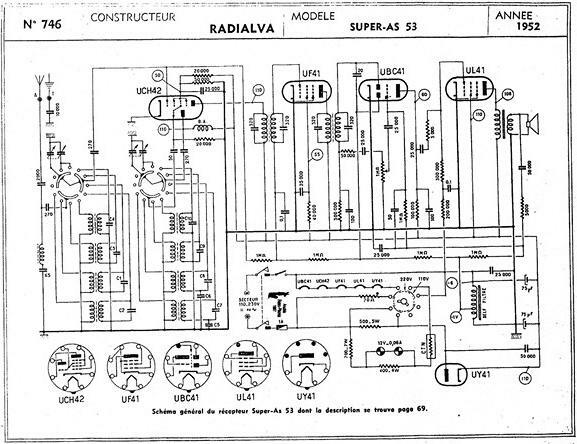 This Radialva was called the "Brio" and was made ca. 1950.
with a fancy plastic dial surround, plaskon knobs and trimmed with white rubber stripes. Model "SuperClips", miniature (only 8"wide, 5"high), made of 3 separate plaskon pieces and metal top grille. Click Here for a close-up. 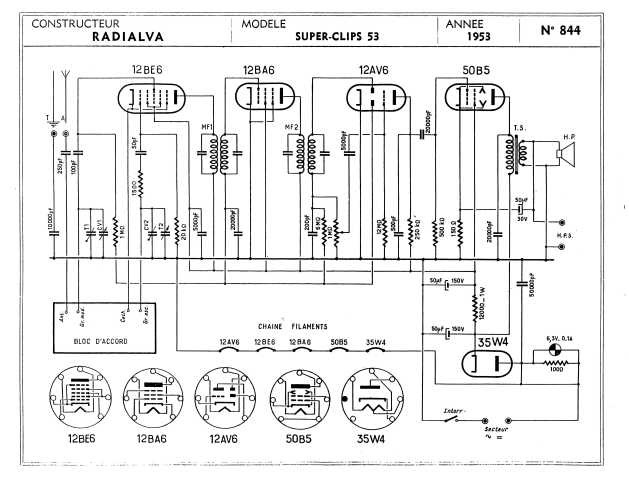 Here is a Schematic for the Superclips. and the AS53 with a beautifully marbled cabinet were made in the early '50s. 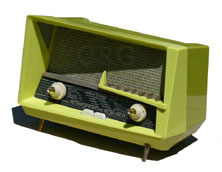 The AS53 is the only French radio I have ever seen made with a marbled beetle plastic. faux snake-skin trim next to the center nameplate and a mirrored dial, just to mention some of the interesting features. Made from of metal, wood, plastic and glass. Model "Telemonde", made from white plaskon with a mirrored dial. Model Excelsior 55, an absolutely wild design, made in France by SNR (Societe Nouvelle Radio - Electrique). with painted metal cabinet, 1954. The radio measures 22 inches wide, 15 1/2 inches tall and 7 inches deep. with Corinthian illuminated glass pillars that accentuate the art deco styling. This stunning, marbled bakelite radio stands nearly 17" tall. with chrome trim and a mirrored dial and a tuning eye. 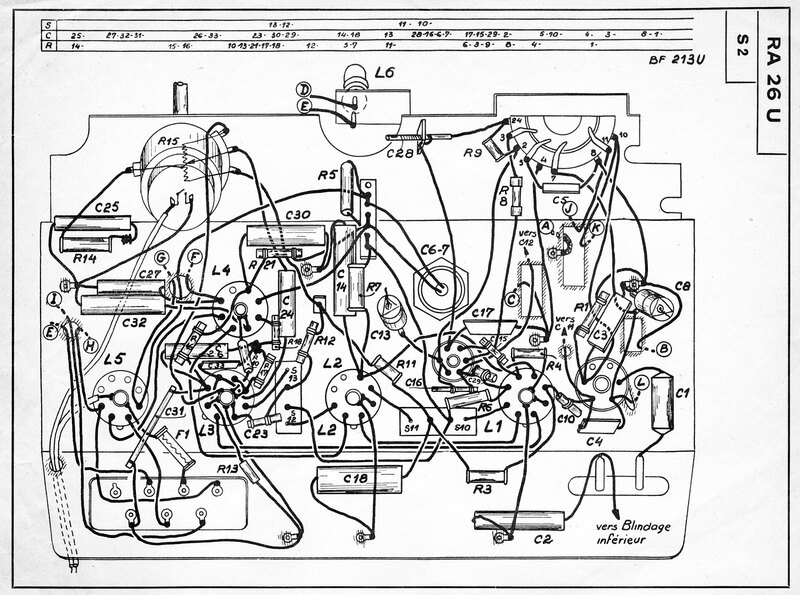 The model 301 was a version that did not include the tuning eye. They were made in 1949. 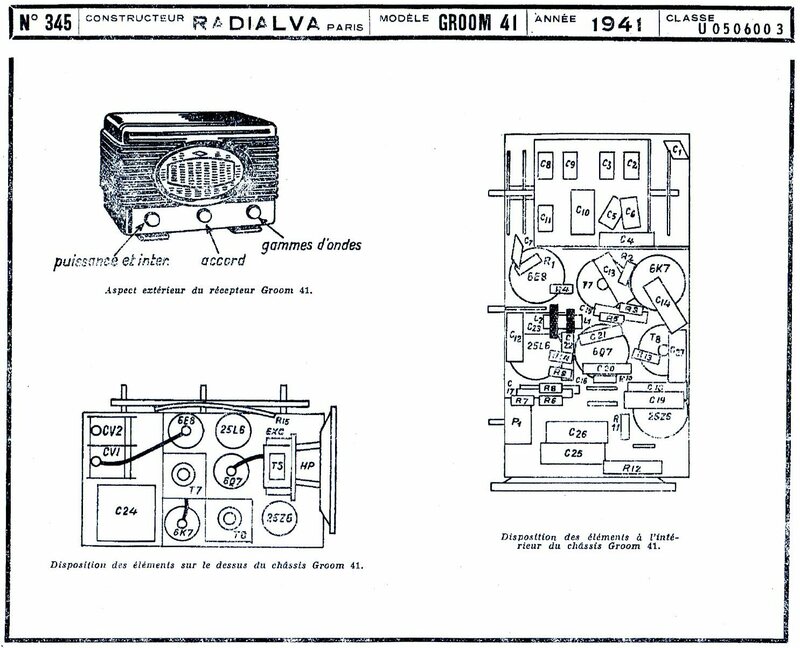 Many reproductions of the radio have been made in different sizes in recent years. 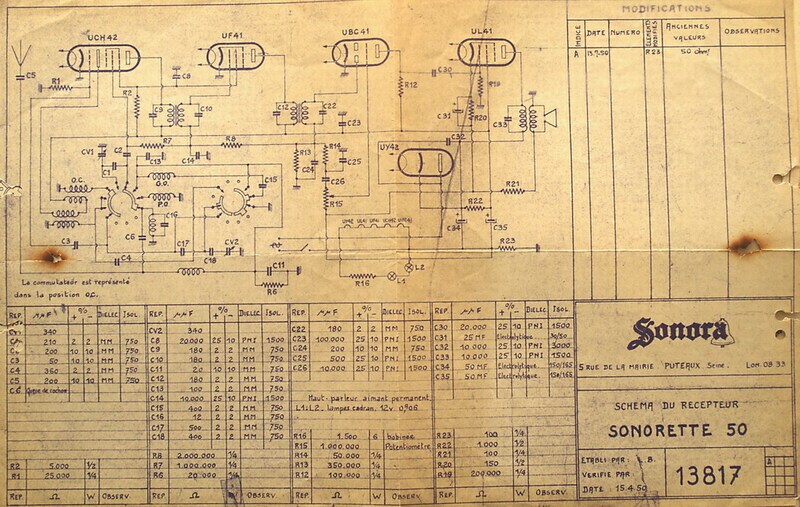 Highly collectible Sonorette 50. A very small bakelite that was available in red, green, white and marbled brown cabinets. Large bakelite Tecalemit "Super 54" - an early bakelite made in 1935. Midget Zodiac "Moskito 550", only 5" wide! Brown bakelite with white painted trim and enamel emblem. A 2 band radio with 5 tubes squeezed into the tiny cabinet. Laptop and Desktop users, Click on the to see a Flash interactive view of the radio. for personal use only, PLEASE DO NOT publish these images or post on other websites without permission!